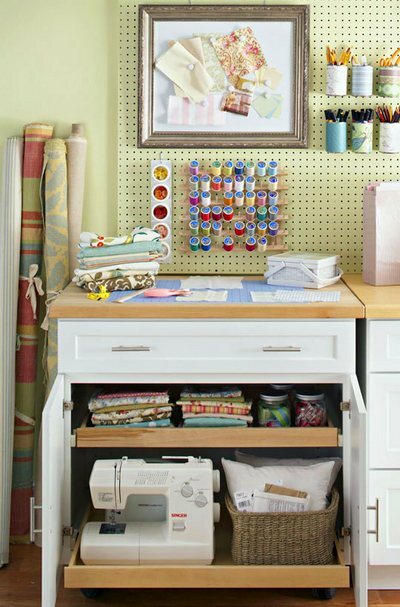 Many of you do not have a "space of your own" in your home where you can sew. A place where you can leave up all your things and work at anytime without hauling it all out. How do you find a space of your own? First take a very close look at what you have. Yes… it ALWAYS starts here! So you need a table that can be left up with the sewing machine on it. In an extreme pinch you can get out the mat and rulers to cut when needed. Now to find a place for this table .. don’t worry yet about what the table is.. let’s find a spot first. Bedroom…often there is a corner here you can clear out and use. Family/living room – there MUST be a tiny spot a table can go. Dining room – as a kid that is where my spot was… my parents put the sewing machine in the dining room. That gave me the table to use. Eat in kitchen… maybe not the ideal spot, but many have a built in cubbie place you could modify for a sewing machine. Or put the machine in a lower cabinet to pull out quick, use your counter for a the cutting station… be creative here. Bathroom…mmm… not sure on this one! 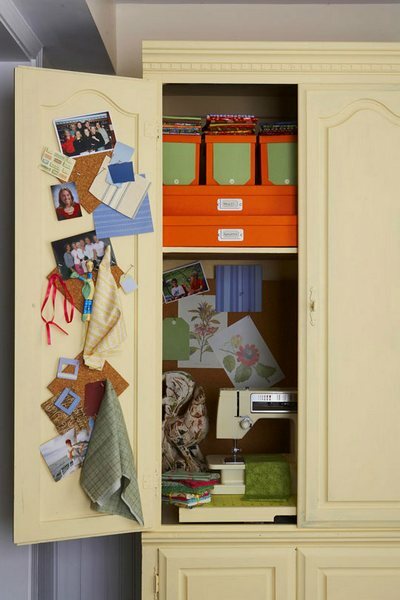 Closet – often there is a closet in a room you could take over. Remove everything in it (as most likely it’s storage and junk). Then convert the whole closet into your studio. There are tons of these make overs on the Internet to look at. Part of a book shelf- you can either store the machine on the shelf, or actually make a shelf extension that is the table you work on. Does this get you thinking? Be CREATIVE and really look hard at what in is in your home. Do you have unused things in a room that can be moved or donated elsewhere? Do you have things in a room that could go somewhere else? Have you used a creative spot? Post question/photos on spots in your house you think you can used. Now for the table. There are tables that fold down from the wall, small tables that you can find at yard sales, tables you may already own! There are tables built just for the machines and the machines go down into them. For years my main sewing table was a kitchen counter clamped to legs my husband built for it. The legs make it the exact right height, the counter was smooth and had finished edges. We bought the counter at the hardware store for very little as it was a reject. Customers special order and something is not right so the counters are sold at a good price. This is a great option for making a table fit a space you have. Here are a few sites with spaces to check for ideas… link to others in the comments! Sewing Closet Revamp; Using Every Inch Wisely! So look around and find a space, and a table.. report back! And now for the Link Party! Share a link to your blog post or Flickr photo of your area in most need of work.. or your whole ‘before studio’.. I can’t wait to see your space! C&T Publishing have generously donated two copies of Organizing Solutions for Every Quilter: An Illustrated Guide to the Space of Your Dreams. Two winners will randomly be selected Monday, February 20th from those sharing their spaces in the link party. Non-USA winners will receive the ebook version. This is so interesting! We have been redoing my room this winter and I’m finding lots of UFO’s! My space is spread out around the house – since I shared my space on my blog, I’ve started several new projects, and added some bins underneath the long arm to keep them sorted, clean, tidy…..but really no idea how I can do things any better in the space I currently have! I have a small space in our living room, as I like to stay where the rest of the family is. But now my space is such a mess, and I’m glad you inspired me to clean it up a bit. Hope to show you a nice and tidy table in a weeks time. Thank you! I am lucky I have a room with my hubby for sewing and computer. I have always wanted a professional to come in and change my sewing space and the whole house. I would love to see what someone eles would do. Maybe I could be on TV haha. I am fortunate enough to have a room all my own. Of course, I still barely fit! I sell ribbon and trims, as well as handmade items, so this room is a workroom, inventory storage and my office! I am slowly getting organized, but it is always a process in motion. The book would be a wonderful help! Thanks so much! How funny! I just posted a post on my blog. 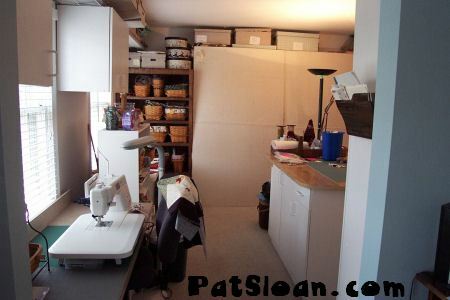 I am actually in the process now of remodeling my sewing room. The pictures I left are the before pictures I posted. I am really looking forward to this! I would love all the input I can get! loving all the before pics! I love organizing and actually, in addition to my creative blog, have an organizing blog where I share sites like yours to inspire my followers. Quilting (crazy quilting actually) is fairly new to me and I am really trying to work through organizing all of the needs for supplies and my shared office/sewing room. I thought I had it figured out, but it isn’t working as well as hoped. I would love to win this book for inspiration and help with some solutions. Aw, shoot. I missed out on posting my room. Oh well, nice to know I am not alone in my need to clean. LOL. That is ok, I will have to do a post to continue with my organizational journey through out my home.